When a friend of mine recommended this book, I downloaded it immediately...but for some reason, I just didn't read it. It sat on my Kindle for longer than I am willing to admit. After reading Thomas More's Utopia, though, I was looking for something radically different, and so I turned to A Discovery of Witches. Wow. I can't believe I waited this long to read it. Almost immediately I was drawn in--which was surprising. I didn't even realize I was a fan of this genre. Well, I totally love Sci-fi, so maybe it's just as predictable that paranormal romance might appeal to me. First let's start with what the book is about. The book is about Diana, a witch who refuses to use her powers. Instead she opts for a "normal" academic life. Her path has lead her to Oxford, and she is studying alchemy in preparation for a huge presentation. That's where the story begins and a weird turn of events brings a variety of "creatures" into her life. She's none to happy about it, but when she realizes they aren't going away, she's forced to engage. It all revolves around a manuscript she accidentally came across--one that is ancient and valuable to the emerging creatures in Diana's life. Diana is aggressively pursued by Matthew, a vampire who seems particularly dangerous and interested in Diana for more than her "great personality." Amidst a backdrop of complication, the two of them embark on a journey--a discovery-- of lineage that is more dangerous than either of them could have ever anticipated, opening wounds of an entire community of creatures, many of whom will be forced to choose a side. Deborah Harkness writes with a great sense of description that is neither too lengthy nor too brief. Her knowledge concerning a variety of topics really drew me in--alchemy, for one, and architecture for another. Also, she has a great sense of history and of wine. That's one of the things that really drew me into the book; smart writing paired with a wide working knowledge of history set against the backdrop of paranormal themes and a love story--I mean, really, who can resist that combination?! I would also like to take a moment to appreciate her sense of plot and creativity. Her plot lines don't take hokey turns, which can happen in these types of books, but they don't. She had me in this story--imagining what would happen next when I was supposed to be concentrating on my exercise class, or my lunch. The way she lays out the story doesn't seem drawn, but rather necessary. Everything has a place and a deliberate nature that makes each piece essential to the story. Harkness doesn't muttle it up adding unnecessary people and things into the story. She stays on point incredibly well considering just how much is really going on this book. This book is also nice and long, which allowed me to savor it over a week instead of blowing through it in a day. Simply stated, great book. 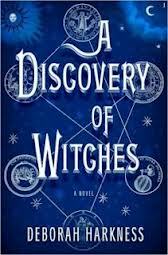 If you enjoy sci-fi, or even a good mystery, I would give A Discovery of Witches a read. You will be spellbound. And thanks to my friend for recommending this book--she seriously has great taste in books. She also recommended The Hunger Games, which got me reading fiction again. So I owe her another debt considering how truly great this book was. Second book, Shadow of Night--downloaded.